I am simply reporting on this 1999, 841 page reference book. I am not claiming to have read every entry! 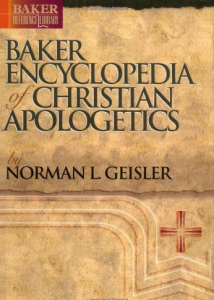 I have always enjoyed Geisler and appreciated his many contributions to philosophy, theology and apologetics. I also find myself reading in the field of apologetics because the ministry is very much a defense of what we believe. This is one of those helpful tools that helps you keep definitions straight and find simple explanations to complex subjects. Expensive but good.